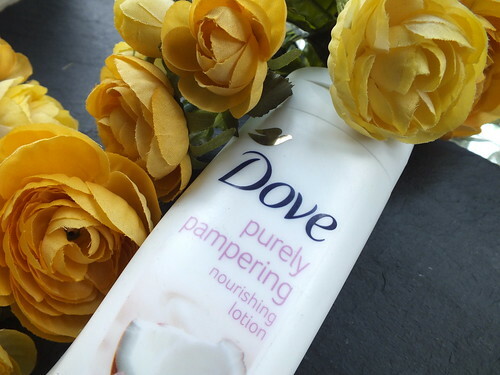 When I was asked to try Dove's Purely Pampering Nourishing Lotion I was immediately drawn to it's claim that it would leave skin nourished for 10 days. I've always been notoriously bad about using body lotions, I might have a spur of the moment urge to lavish some cream on after a bath or maybe add some sparkle for a night out like I did here but as a general rule it was something I never really bothered with. So a product that suggests I do not have to apply on a daily basis was perfect for me. Since receiving the Coconut Milk and Jasmine Petals* scent I have used it with great regularity (not daily but we can't expect miracles!) and this very bottle will be featuring in my next Empties post having used it all - I do not think in my life I have used a body lotion up in it's entirety. I love coconut scents and with the addition of relaxing jasmine made for a perfect combo. The light formula has been perfect to apply at the end of a hot and sticky night when the last thing you want to do is climb into bed with creams that are too heavy and going to make you uncomfortable. It's also made a good addition to my faux tanning routine and worked in perfect harmony avoiding pasty pins and scaly dry patches. It's an all round winner in my book and that's why it's my August favourite. I have walked past this lotion forever.....I'll pop some in my cart next time and give it a try!